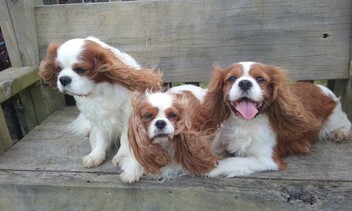 *Are you looking to add a Cavalier King Charles Spaniel puppy or older dog to your family ? We give guidance on looking for a responsible breeder. *Do you already have a Cavalier King Charles Spaniel ? We offer support and advice on health, care and the general well being of your Cavalier. A friendly and welcoming group with suggestions and helpful tips on everything to do with living with a Cavalier. Learn about the breed while you wait to get a puppy of your own. Jan does an amazing job with the dogs, our cavalier loved it. She posted videos of him running around on their huge excellently fenced section on Facebook for us to see how he was going. She knows exactly what she's doing when it comes to dog caring and we know she loves all of her visitors as much as their owners. Thank you again Jan.
Our pup Kona went to stay with Jan for a month and he has come home to us as a happy, confident, mature boy. He has really benefitted from the experience, Jan's TLC and the socialisation with the other cavaliers. We were so excited with his progress since holidaying with Jan that we have decided he needs a mate so Kona is expecting a new brother in the next 2 weeks. I can't rate Jan's care highly enough and we will definitely be utilising there services on a regular basis for our boys. My two little girls absolutley love staying with Jan. I was a little nervous about leaving them with someone however after meeting Jan and looking around the premises my concerns were put to rest. The last time we dropped them off, they knew exactly where they were and couldn't wait to get out of the car to greet Jan and the rest of the dogs. When you leave your dogs with Jan you can gaurantee she will love & care for them as her own. It's a blessing to have a holiday and not have to worry. jan at darilance is the best place in the world to leave your beloved pooches while you have to go away - the fact that my 2 cairn terriors would be integrated into a caring household and treated as one of the family - was a great re-assurance to me while overseas - i received regular emails updating me on my dogs holiday and even a video clip of them playing with all the other dogs - just marvellous - thank you jan - we will be back! Our 5 month old pup, Penny, has just come home after 3 days with Jan & Darilance. Jan is fabulous with all her dogs and Penny was welcomed as one of the family. She came home calm and happy and photos of her fun time at Darilance soon followed by email. Jan has been fabulous with advice for us as we are first-time pup owners and I'm thrilled to know Penny will have a second home when we need to get away or have work commitments that make us busy! Recommend to all! Our dog had a lovely time staying at Jan's home and playing with her dogs. Our dog is quite shy with other dogs and I was a little worried with how she would manage, but she was very happy and actually seems a little sad to have left Jan's! Was very reassuring and comforting to know she was being well looked after and loved. Thanks Jan. I would recommend Jan to anyone requiring doggy daycare or boarding. My dogs always enjoy playing with Jan's dogs on her beautiful property. Jan has been very helpful in giving me advice when I have had any questions about my dogs. She is a genuine dog lover and treats any dog staying with her as one of her own.